I love holidays especially when it’s still summer and the family can enjoy a special time. This week we celebrate Labor Day in style and what better way than to prepare a delicious cookout. On this occasion I made delicious pork sliders, which have been a success in my family, which makes me very happy because there are times it is hard to get kids to eat new things. Super easy to make and only require an occasional ingredient and to make your day even easier you can cook the pork since previous day and serve at room temperature. The holidays are a time for families to enjoy a great time and for that reason we should not complicate, I invite you to make these delicious mini burgers that will delight every member of your family. In a hot pan with oil, cook the meat for 20 minutes, turning every 5 minutes. Once the meat cooked, let rest and slice. Split the bread, place half a teaspoon of pesto on top of each bread, place 2 slices of meat, a slice of tomato, 2 slices of avocado and other top of the bread. To continue with this celebration, here are more delicious recipes to enjoy. 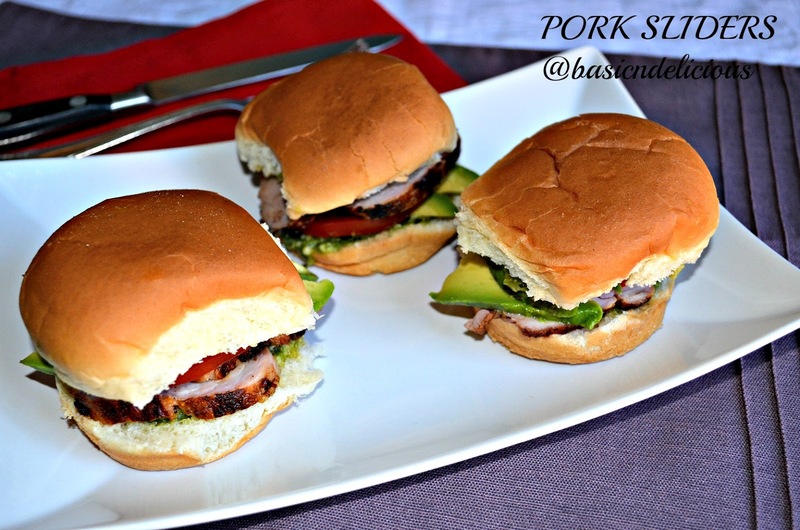 This entry was posted in #SundaySupper and tagged pork, sliders by Kathia Rodriguez. Bookmark the permalink.